Of all the different types of clouds, cumulus clouds are probably the most recognizable. How does this cloud formation look like and what does it say about the weather? To learn more, continue reading. Cumulus clouds are clouds that resemble piles of cotton floating in the sky. They are largely identified by their well-defined lines and rounded shape. The Latin term cumulus means heap, which aptly describes the cumulus cloud formations. Larger cumulus clouds often exhibit cauliflower-shaped summits. Cumulus cloud is often associated with fair weather, though it may bring short yet heavy rainfall. This cloud formation is also responsible for producing cold frontal systems. Cumulus cloud formation has a white, fluffy appearance which usually reminds you of cotton balls. This downy look is due to lingering air bubbles. Sometimes, they may also manifest as thin and flat although they often have flat bases and bumpy outlines. 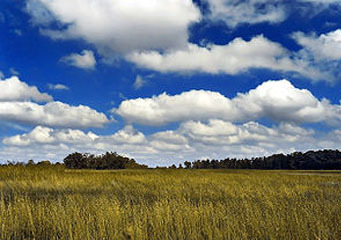 Cumulus clouds are generally connected to friendly weather. You will find cumulus clouds within 6,500 feet above the ground. In a very hot day or when high winds are forced into mountainous regions, cumulus clouds may form higher than 39,000 feet. When this cloud is taller than wider, it is referred to as a towering cumulus cloud that produces rain showers. Cumulus clouds are generated by atmospheric instability coupled with turbulence and convection. This occurs when the warm air ascends, cools and eventually condenses forming cumulus clouds. The volume of these clouds is largely dependent on the atmosphere’s temperature profile and if there is any inversion at hand. Cumulus clouds may come in several forms. Let’s take a closer look at each one of them. This cloud formation is short, appearing like small clusters of cotton in the atmosphere. It is found between 3,000 and 18,000 feet above the Earth’s surface. Cumulus humilis is often referred to as fair weather clouds. Cumulus Mediocris is a type of cumulus cloud which has a moderate size; its height is about the same as its width. They are often arranged as cloud streets or lines parallel with the wind direction. These cumulus cloud formations have towering cauliflower-like tops extending over 50,000 feet above the ground. Cumulus congestus often contain huge amount of rainfall and may develop into the thunderstorm-producing cumulonimbus cloud. Cumulus fractus clouds look like fragmented cloud formations with sharp ragged edges. Cumulus clouds can develop anytime of the year in almost all parts of the globe except in the Polar Regions. They are very common during summer. Cumulus clouds are some of the most identifiable cloud formations in the sky. But just an additional tip to help you spot them; hold up your hand at arm’s length. If a single puff of cloud is as big as or larger than your fist, you probably are looking at a cumulus cloud. Though generally considered as fair weather clouds, cumulus clouds can develop as cumulonimbus which brings bad weather.